Monday, September 3 2018. 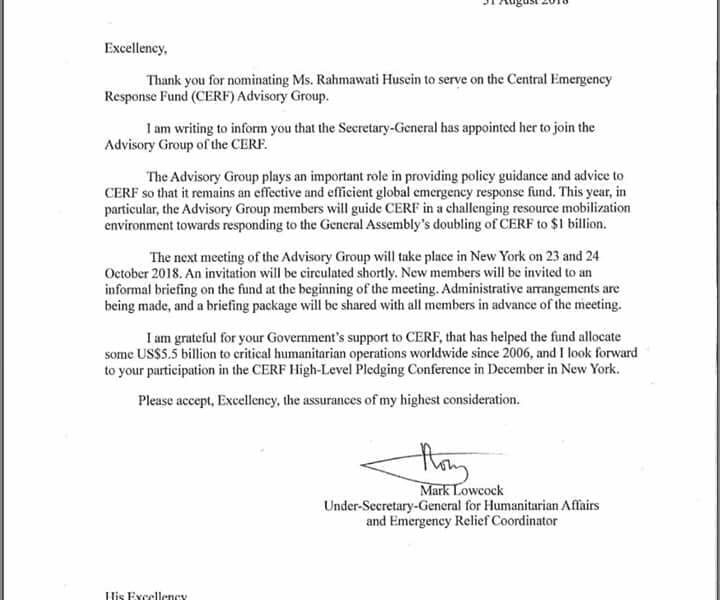 Vice Chairperson of Muhammadiyah Disaster Management Center (MDMC), Rahmawati Husein was elected as a member of the United Nations Central Emergency Response Fund (CERF) advisory based in New York. CERF is one of the pool fund mechanisms facilitated by OCHA to manage annual funds of USD 450 million. Obviously this is a prestigious and strategic position in the international humanitarian world, namely to oversee the use of humanitarian funds collected through the United Nations. Rahmawati, who is familiarly called Ama, aside from serving as Vice Chairperson of MDMC PP Muhammadiyah, also served as MLHPB PP ‘Aisyiyah, the steering committee member of BNPB, an advisory member to the Head of the Presidential Office of the Republic of Indonesia. In addition, he also still actively teaches as a lecturer at Muhammadiyah University of Yogyakarta. Rahmawati received various awards, including awards as an inspirational figure from the National Disaster Management Agency (BNPB). In addition, she also often attended various international forums. In fact, Rahmawati once represented Indonesia as a panelist in the ‘High Level Debate Panel’ which was organized by the United Nations International Committee of The Red Cross (ICRC). In the world level, Rahmawati also became a Liaison Officer (LO) from Indonesia by providing humanitarian assistance after the Nepal earthquake for three weeks.